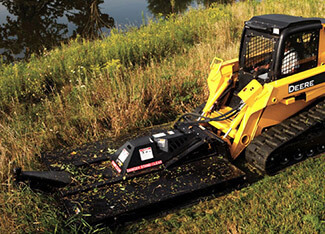 B-Series Rotary Cutters offer a redesigned drivetrain to improve performance, efficiency, and reliability. The cutter's rigid 6-mm (0.25 in.) steel deck, formed side plates, and heavy-duty skid shoes provide solid strength and durability in both forward and reverse. The triple bi-directional blade design provides better balance for smooth operation and increased cutting efficiency. An optional pressure gauge allows you to monitor blade load to prevent overheating and overloading, to keep you running safely and productively. The optional under-mounted front steel wheels cut evenly and add life to the cutting blades by keeping them off the ground and preventing scalping. Like all Worksite Pro™ attachments, these rotary cutters are optimized to work with John Deere skid steers and compact track loaders. In addition, they're compatible with most comparable competitive models. See your local John Deere dealer for details.